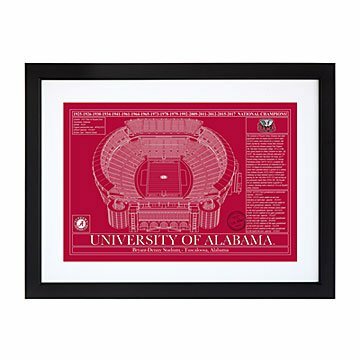 These prints celebrate your favorite college football stadiums. Remember your alma mater's homecomings and big wins with these Collegiate Stadium Blueprints, showcasing your school spirit in classic style. Evoking the nostalgia of midcentury architectural plans, each illustration lays out the details of your favorite college field in a palette that matches your school's colors. The drawings are accompanied by that stadium's design specs and highlights of major events. They're a great gift for anyone who can still hum their school's fight song. Printed on museum-grade, archival paper and framed in black BonanzaWood® using acid-free archival board. Made in Portland, Oregon. Click here to see all available stadiums. Perfect for any college football fan! He was thrilled with the picture! Great product but info was wonky. Got this for my BF who is a Berkeley grad and HUGE fan of the Golden Bears. He loved it but the first thing he mentioned was the name. It came with the listing "Kabam Berkeley Memorial Stadium". He immediately said " That's not what it's called". I thought since it was a "blueprint" perhaps it was originally named that and it has changed over the years. He said no. He was certain. After much googling we discovered Kabam is a company that has bought rights to the stadium name for 15 years. So, it's basically a product placement. Much like "Cheeze-It Bowl". I am kind of unhappy with that. It lacks authenticity of the blueprint being original, even if we are only faking it. AND it will also be temporary - meaning the gift in a decade or so will be outdated. If you can make one without that, I'd get it. Oh! He also noted some point of architecture that weren't in the print - such as detached arches due to the stadium being right over a fault. Anyway, my BF is a genius who knows everything. So, perhaps the info being accurate isn't so important to everyone. But just some things he noted. He was still very impressed but I think that kinda threw him off. And definitely made me self-conscious about the gift and authenticity and coolness. But it is very beautiful and impressive looking. I guess the devil is in the details. This, I think may have the ultimate gift this year. Not sure it can be topped. He absolutely loved it! Very high quality mounted blueprint in a very nice frame. Worth every pennY! My husband loves this picture of his alma mater stadium and thought it was very cool. He couldn't wait to hang it up in his man cave. Please get a bigger selection of Schools i.e. Naval Academy, West Point, Air Force, etc. I bought this for my husband for his birthday. He loved it. It is very nicely done. the framing looks great. My husband, who is a huge Michigan football fan, loved this and it's already hanging in his man cave. I bought this as a house warming gift for my son and his finance who both attended graduate school at Michigan. They were very impressed with the uniqueness of this print and the way it was framed. I thought it was the perfect house warming gift for two Michigan graduates.